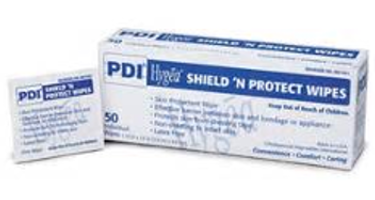 Hygea Shield 'n Protect wipes are individually packaged, providing you with an effective barrier between skin and any manner of tapes, dressings, appliances, and adhesives. The ingredients in the quick-drying wipe are non-irritation to intact skin. This is a latex-free product.